Bridewell Palace, London, was originally a residence of Henry VIII, and later became a poorhouse and prison. 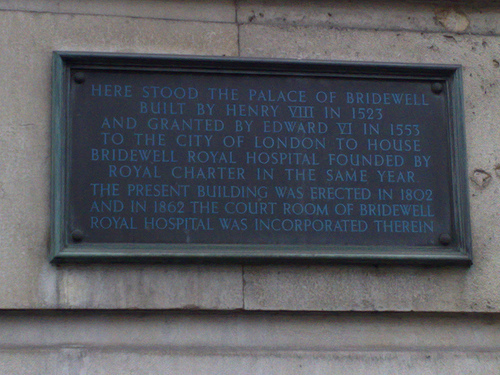 Similar institutions throughout England, Ireland, and Canada also borrowed the name Bridewell. Nowadays, the term frequently refers to a city’s main detention facility, usually in close proximity to a courthouse, as in Nottingham, Leeds, Gloucester, Bristol, Dublin and Cork. Freethinker writer Peter Annet was sent to Bridewell Prison for one year’s hard labour. 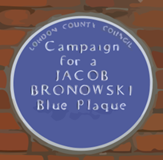 He was also sentenced to Newgate prison for one month for blasphemous remarks on the five books of Moses. The Prison was originally located at the site of a gate in the Roman London Wall. The gate/prison was rebuilt in the 12th century, and demolished in 1777. The prison was extended and rebuilt many times, and remained in use for over 700 years, from 1188 to 1902. The original gate house is incorporated as the front of an office block at 14 New Bridge Street, including a relief portrait of Edward VI; The main site area of the school/ palace stretches from there southwards along the west-side of the street to the Crowne Plaza Hotel and Unilever Building, (built 1931), which stands at the corner of ‘Watergate’ the previous river entrance to the precincts, off the Fleet-Thames confluence.